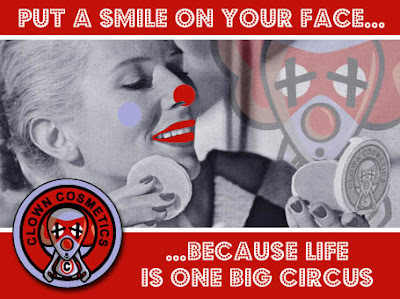 KawaiiPunk - Kawaii Mascot Blog: Clown Cosmetics! A frightening thought, as I’m sure many of your readers will agree, but one that would surely never happen…? Well, given that the nightmare that was 1980s has recently seen a revival in fashion and music, I fear that a world where looking like a clown became de rigueur could be a lot closer than we think! After all, if the youth of today think the 1980s were cool, surely looking like a clown can’t be far behind! I mean, remember the New Romantics? Urghhh! Anyway, just thought I’d share this concern with you, and see what you thought. Jeffery, you can rest assured that this brand new world you fear so much will absolutely never happen! Trust me on this! I’ve been trying to popularise clowns for years, and believe me when I say… there ain’t no one buying! Although, on a personal note, I do think your Clown Cosmetics look absolutely brilliant!